We’d love your help. Let us know what’s wrong with this preview of Pema Chödrön's Compassion Cards by Pema Chödrön. 59 beautifully designed cards on the classic Buddhist practice of lojong for everyday inspiration and contemplation--with instructive commentaries by Pema Chodron to make the teachings accessible and applicable to contemporary life. Let compassion and fearlessness guide you and you'll live wisely and effectively in good times and bad. Here Pema Chodron offers a powerful me 59 beautifully designed cards on the classic Buddhist practice of lojong for everyday inspiration and contemplation--with instructive commentaries by Pema Chodron to make the teachings accessible and applicable to contemporary life. * and an audio download of Pema's teachings on the related practice of tonglen. 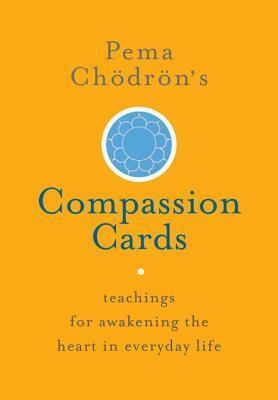 To ask other readers questions about Pema Chödrön's Compassion Cards, please sign up. These are simple lojong cards, one for each of the Buddhist Lojong "slogans" (short phrases to contemplate). Not a book, per se, though the totality of these will make up a future book by Pema to be released later this year. The cards themselves are typically used in conjunction with meditation practice. I'm hesitant to count this as a 'book I finished', as it is neither. Cards, not a book; and part of an ongoing practice, not a 'one and done' read. But, with those caveats in mind, these cards h These are simple lojong cards, one for each of the Buddhist Lojong "slogans" (short phrases to contemplate). Not a book, per se, though the totality of these will make up a future book by Pema to be released later this year. The cards themselves are typically used in conjunction with meditation practice. I HAVE THESE CARDS AND AM SO GRATEFUL FOR THE TYPE OF BOX USED. IT IS SO EASY TO OPEN UNLIKE MANY OTHERS I HAVE. I WOULD LOVE TO KNOW WHO MADE IT SO I CAN GET ONE FOR SOME INSPIRATIONAL CARDS I AM MAKING. Ani Pema Chödrön (Deirdre Blomfield-Brown) is an American Buddhist nun in the Tibetan tradition, closely associated with the Kagyu school and the Shambhala lineage. She attended Miss Porter's School in Connecticut and graduated from the University of California at Berkeley. She taught as an elementary school teacher for many years in both New Mexico and California. Pema has two children and three g Ani Pema Chödrön (Deirdre Blomfield-Brown) is an American Buddhist nun in the Tibetan tradition, closely associated with the Kagyu school and the Shambhala lineage. She attended Miss Porter's School in Connecticut and graduated from the University of California at Berkeley. She taught as an elementary school teacher for many years in both New Mexico and California. Pema has two children and three grandchildren. While in her mid-thirties, she traveled to the French Alps and encountered Lama Chime Rinpoche, with whom she studied for several years. She became a novice nun in 1974 while studying with Lama Chime in London. His Holiness the Sixteenth Karmapa came to England at that time, and Ani Pema received her ordination from him. Ani Pema first met her root guru, Chögyam Trungpa Rinpoche, in 1972. Lama Chime encouraged her to work with Trungpa, and it was with him that she ultimately made her most profound connection, studying with him from 1974 until his death in 1987. At the request of the Sixteenth Karmapa, she received the full bikshuni ordination in the Chinese lineage of Buddhism in 1981 in Hong Kong. Ani Pema served as the director of the Karma Dzong, in Boulder, CO, until moving in 1984 to rural Cape Breton, Nova Scotia to be the director of Gampo Abbey. Chögyam Trungpa Rinpoche gave her explicit instructions on establishing this monastery for western monks and nuns.